The hot springs at Sempaya are the key attractions in Semuliki National park and are worthy of encountering while on Uganda safaris. 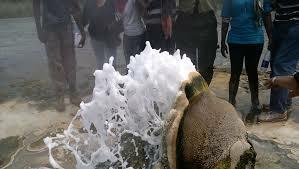 Semuliki National Park has got two hot springs thriving in the southern sect of the park in a low-lying swampy area. The male hot spring is called Bitente and is positioned approximately 30 minutes’ walk from the Sempaya park headquarters. It stretches for over 12m in diameter. 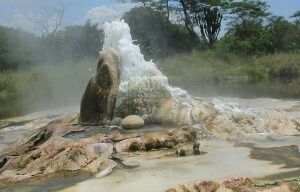 The female hot spring Nyansimbi is also close to park headquarters and is marked by boiling geyser spurring up to 2m in height visible with in 2km distance and boiling to 100 degrees Celsius. The local people draw much attachment to these natural features as they have for many years used them as healing grounds for their fungal infections and skin diseases. The National Park of Semiliki is surrounded by diverse tribal groups that number to four. 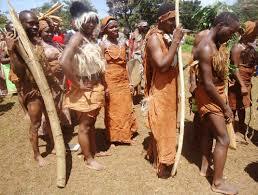 They include; the Bamba, Bakonzo, Batwa and Basongora. These tribal groups have got diverse traditions that are interesting to encounter while on Uganda safaris. The pastoralist Basongora draw much attachment to their cattle and cherish the rift valley flats in which they thrive while the Bakonzo and Bamba till the slopes of Rwenzori mountains and are primarily cultivators. The Batwa who have got strong attachment to the forest were former forest dwellers before they were evicted to pave way for conservation. They are among the last groups of short people that are currently existing on this planet thus it is very significant to encounter them while on safari tour in Uganda. The forest of Semuliki is regarded to be among the mature forests of Uganda and its forest landscapes are ideal habitats for a range of birds. It is no surprise that the park contain 350 species of birds of which 23 are endemic to the Albertine rift comprising about 90% of the Albertine restricted species. Among these birds include; Short-tailed Warbler and Blue-headed Sunbird as well as seven IUCN red data listed species. The common ones include; African Emerald Cuckoo, Common Bulbul, Red-headed Bluebill and African Blue and White-tailed Blue Flycatchers. 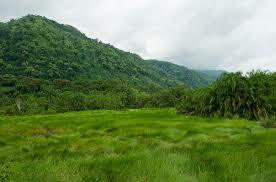 The low land tropical rain forest characterizes Semuliki National Park and is classified as moist deciduous. It has 336 tree species some of which are restricted n range to Semuliki forest and few other adjacent forests like Lovoa swynnertonii and Cordia millenii which are recorded as endangered in the Semuliki National Park. The cynometra trees characterize the center of the park while the forest edges are marked by riverine swamp vegetation along River Semuliki and lush vegetation around Sempaya. 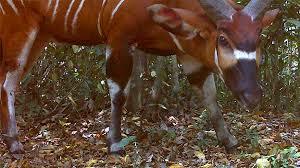 The Semuliki National Park has 53 mammal species of which 27 are large mammals. The park There are 11 species of wildlife that are restricted in range to Semuliki among which include; pygmy antelope and 2 species of the flying squirrel. The park also has other wildlife species including; forest buffalos, forest elephants, crocodiles and hippos found in the Semuliki River, water chevrotain, also referred to as the “fanged deer” and the blue duiker. Semuliki forest is also marked by a range of primates including; baboon, grey-cheeked Mangabey, Chimpanzees, central African red Colobus, Dent Mona monkeys, vervet monkeys and black-and-white Colobus monkey. The Nocturnal primate species also thrive in the park including; Bush babies and Pottos. The game drives offer you an opportunity to encounter a range of wild game that thrives in Semuliki National Park. 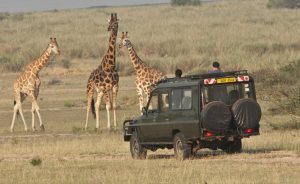 There are three tracks that were put in place to enable travelers on Uganda safari encounter the wildlife. These tracks stretch up to Toro Semuliki wildlife reserve with opportunities of encountering larger and smaller forest elephants, buffaloes, waterbuck, crocodile, warthog and Uganda Kob. The Pygmy hippopotami, bush babies and leopards can be seen though on rare occasions. The game drive activity in Semuliki National Park is carried out in the morning, evening and at night offering opportunities to spot nocturnal like white tailed mongoose. 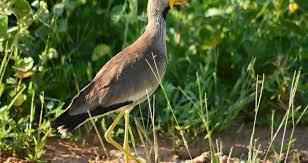 Semuliki National Park presents good birding encounters with its range of 350 species of birds of which 23 are endemic to the Albertine rift comprising 90% of the Albertine endemics. The forest parts of Ntandi and Sempaya offer ideal biding encounters while on Uganda safari. Birds of Semuliki that can be encountered include among others; Yellow- throated Nicator, White crested horn bill, Great blue and Ross’s Turacos, Piping Hornbill among other birds. River Kirimia is also another birding hot spot while the Lake Albert shores present ideal opportunities for encountering shoebill stork. The nature walks enable Uganda safari undertakers to explore Semuliki National park on foot. The 13km Kirimia trail 13km that traverses the forest to River Semuliki lasting for 8 hours commencing at 8am. Another one is the 11km Red Monkey Track which traverses the park’s eastern border with chances of encountering the rare deBrazza’s monkey up to Semuliki River. The 8km Sempaya Nature Trail exposes you to the hot springs and counts of primates. This trail allows you to enjoy the hot springs, boil some plantains or eggs. The encounter takes 2 – 4 hours ideally in the morning and in the afternoon. The diverse tribal groups that surround Semuliki National Park can be explored by taking a community tour. The most interesting of these are the Batwa who were once forest dwellers before they were evicted and resettled at Ntandi. Their amazing traditions and stories not forgetting their physical build will definitely leave the traveller in a state of amazement. This is positioned in Kirimia village about 100m from the Kirimia trail head and 10km from Sempaya towards Bundibugyo. The accommodation establishment offers overnight stay with meals. The Semuliki National Park has got a campsite with basic cottages at Bumaga about 2.5km from Sempaya. The meals can be prepared on order while catering equipment is available for hire. 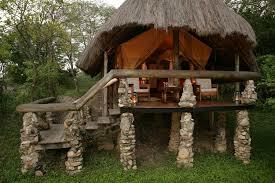 Semuliki Safari Lodge has got eight upmarket, en-suite tented rooms with 18 people maximum occupancy capacity. 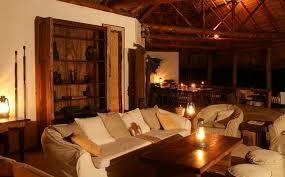 Every cottage has got a fire place, bath room with hot water, thatched roof, flushing toilets and private verandah. The lodge has got a swimming pool, laundry, dining and bar, library or reading area, gift shop and on-site wildlife viewing. Two routes connect to Semuliki from Kampala the country’s capital. The Park can also be accessed by Air travel. Scheduled flights are operated by aero link from Entebbe International Airport. Other Charter flights can be got from Kajjansi airstrip or Entebbe Airport to connect to Semuliki National Park.